Modest Wage Gains In February As Economy Adds Robust 313,000 Jobs : The Two-Way The largest increase in jobs in 1 1/2 years was accompanied by a 2.6 percent year-on-year increase in wages, a slowdown from January's pace. The unemployment rate held at 4.1 percent. 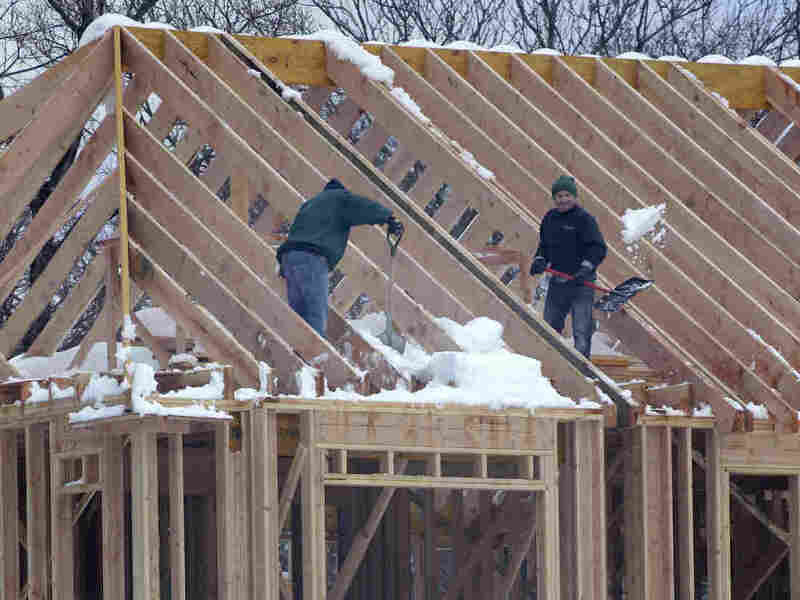 Men shovel snow off the top of a building under construction in Franklin Lakes, N.J., on Thursday. Job growth in February was led by a sharp increase in construction employment. The U.S. added a hefty 313,000 jobs in February — the biggest increase in 1 1/2 years — while wages rose more modestly than the previous month. Meanwhile, the unemployment rate held steady at 4.1 percent, the Bureau of Labor Statistics reported Friday. The Labor Department also reported strong upward revisions for both December and January. January's figure was revised to 239,000 from 200,000 previously and December was pegged at 175,000, up from 160,000. The latest report marks the 89th consecutive month of job growth, a trend that began in late 2010, as the economy began to pick up steam in the wake of the worst downturn since the Great Depression. NPR's Chris Arnold says "this report shows that the economy is still chugging away with employers confident enough to hire a lot more workers." Year over year, wages increased 2.6 percent last month, a slowdown from January's 2.9 percent pace, which triggered a sell-off on Wall Street. On average, wages increased by 4 cents in February to $26.75. It was a more modest gain than the 7-cent increase in January. While wage gains are good for employees, they add to inflationary pressures and could lead to a rise in interest rates that would increase the cost of borrowing for employers. "The gain in average hourly earnings of 2.6 percent over the past year is less-than-stellar for workers, but also helps to calm inflation fears," Mark Hamrick, Bankrate.com's senior economic analyst, said in an email. "Having said that, if we see the February payrolls number sustained, which seems unlikely, that keeps the inflation question very much in play," he said. "There's one really big story here, and that's the average hourly earnings," Jonathan Golub, chief United States equity strategist at Credit Suisse, tell The New York Times. "That's where the conversation will turn." "With Federal Reserve officials considering the labor market to be near or a little beyond full employment, the moderation in wage growth last month will probably do little to change expectations that the U.S. central bank will raise interest rates at its March 20-21 policy meeting. "Slow wage growth, however, could temper expectations that the Fed will change its rate forecast to four hikes this year from three. There is optimism that tightening labor market conditions will spur faster wage growth this year and pull inflation toward the Fed's 2 percent target." The largest gain in more than a decade in construction jobs, up 61,000, let the growth sectors. Retail trade and professional and business services also fared well, with each sector adding 50,000 jobs from January. Manufacturing was up 31,000; financial 28,000; and heath care 19,000. The average workweek increased by 0.1 hour to 34.5 hours. The job gains in February were more than 100,000 more than economists had expected.